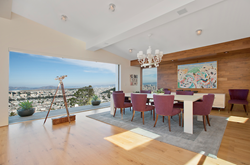 In a recent report published on her blog, Ruth Krishnan, top San Francisco real estate agent, demonstrates dramatic changes in San Francisco’s luxury home and condo, co-op, and TIC markets resulting from a rapidly changing economy and buyer values. There is a lot being written right now about how much San Francisco's character is changing. Which neighborhoods are most affected? 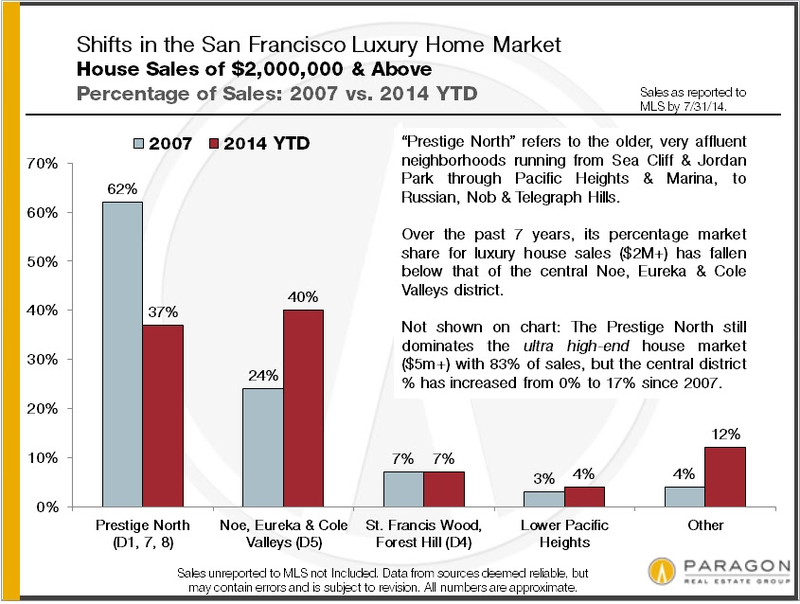 “The general Noe, Eureka and Cole Valley district (much of which was originally blue-collar neighborhoods) is now one of the most sought-after areas of the city, and its prices have blown through the roof - more houses over $2 million now sell here than in all the prestige northern neighborhoods combined,” the report states. “The buyers I have looking to live in these neighborhoods are different from the buyer in Noe,” says Krishnan. “The South Beach buyer often wants a clean, modern building without the fuss of worrying about fixing up an old building. The people attracted to this area love the luxurious feeling of having a doorman and the convenience of package delivery. They aren’t as interested in culture, like the Noe buyer is looking for, or what has been typically considered luxurious, like Russian Hill or Pac Heights. 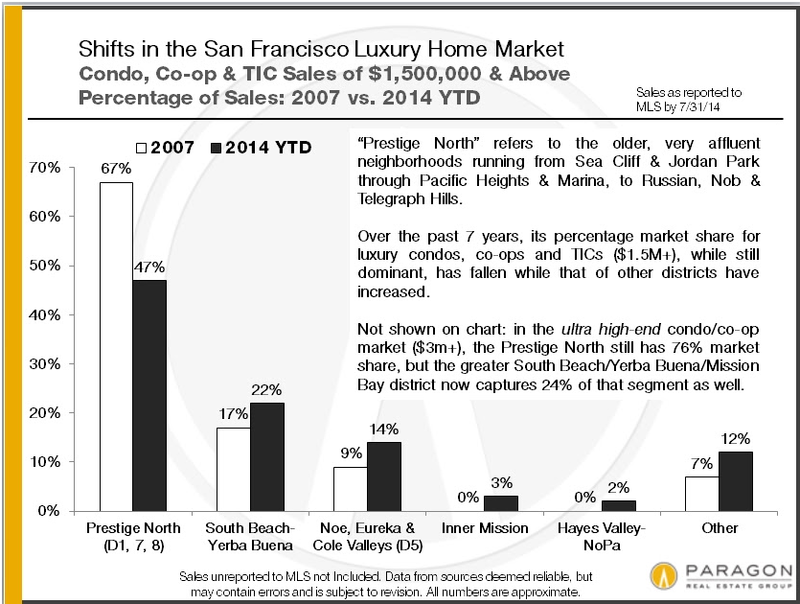 What the South Beach buyer has in common with the Noe buyer is desire for proximity to the freeway. That is an important thing for many affluent buyers in this market." Two charts attached show the shifts that have occurred in just the past 7 years. For the full report, visit http://www.ruthkrishnan.com. About Ruth Krishnan: Ruth Krishnan is one of the San Francisco housing market's top real estate agents. With a background in design and business, Ruth Krishnan brings an artistic eye and strong negotiation and business skills to the arena of real estate sales. Representing both buyers and sellers, and with a expert knowledge and comfort with San Francisco's unique real estate market, Ruth Krishnan has a long history of satisfied clients and successful transactions. To learn more about Ruth Krishnan’s experience as real estate agent, to get free advice about the San Francisco housing market and San Francisco housing prices, or to request an interview contact her at info(at)ruthkrishnan(dot)com.